No more waiting in line or hailing on the streets. No more haggling over prices. Fares are always fixed on GrabTaxi. Free yourself from worry. Share your ride with your friends and get to your destination safely with our pool of trusted drivers. Sit back, relax and enjoy the most comfortable experience on the road with GrabTaxi. Your daily Taxi anywhere, anytime. A more comfortable taxi ride, with nicer car models (Toyota Crown, Toyota Fielder, Hyundai Sonata, or Kia Cerato) guaranteed. Key in your pick-up and drop-off locations to get your estimated fare. 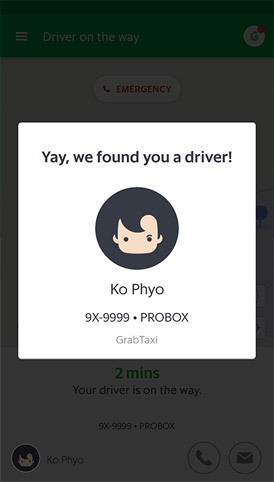 Grab will find you the nearest available driver. Know your driver’s location and estimated time of arrival in real-time. Share your trip details with loved ones for added safety or even just to let them know you’re on your way. GrabTaxi is a service from Grab, that allows you to book on-demand, fixed fare taxi rides. 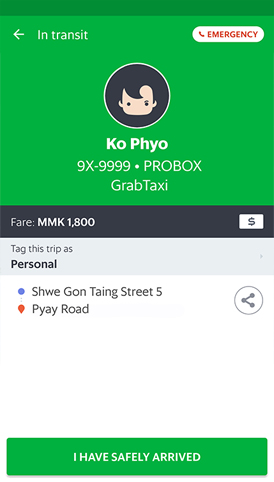 What is GrabTaxi Plus? How is GrabTaxi Plus different from regular GrabTaxi? GrabTaxi Plus provides a more comfortable ride experience with guaranteed nicer car models of Toyota Crown, Toyota Fielder, Hyundai Sonata, or Kia Cerato. Passengers will get to enjoy higher service quality from Grab’s best driver partners. How do I know I have received a promo code? You can find it in your Notification on the Grab App. 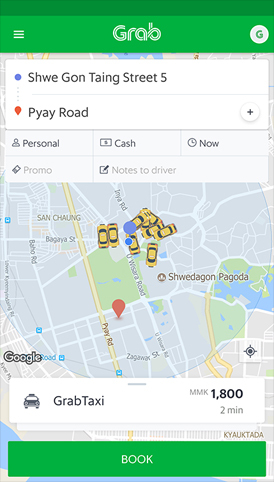 Can I use GrabTaxi promo code on GrabTaxi Plus? No you can’t, unless stated otherwise. What can you do if the driver hasn’t arrived yet? Please use GrabChat or call your designated driver. 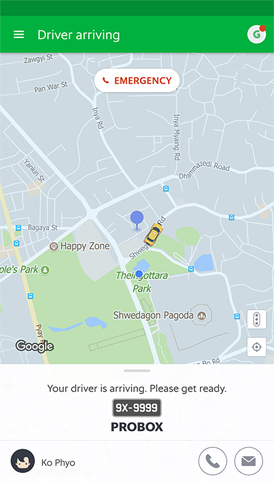 If you are not able to reach your driver, please cancel the trip and book your ride again. If you have any further concerns, do contact our customer service. What is waiting time surcharge? A 5-minute grace period is provided during pick-up. If the driver is required to wait for the passenger for longer than 5 minutes, waiting time surcharges apply in 5-minute blocks. Additional waiting time will be charged 400 MMK for every 5 minutes. i.e. 0 MMK surcharge for 0-5:00 min wait, 400 MMK surcharge for 5:01-10:00 min wait, 800 MMK surcharge for 10:01-15:00, and so on. All GrabTaxi fares are subjected to dynamic pricing due to the demand and supply in your area at the time of booking.